Recchiuti (based in San Francisco, CA) has a nice little shop in the Ferry Building in San Francisco. Market Street dead-ends in front of this building on the West side, and the San Francisco Bay lies to the East. The Ferry Building is lined with shops and is a foodie paradise of sorts. Good place to shop for chocolates. 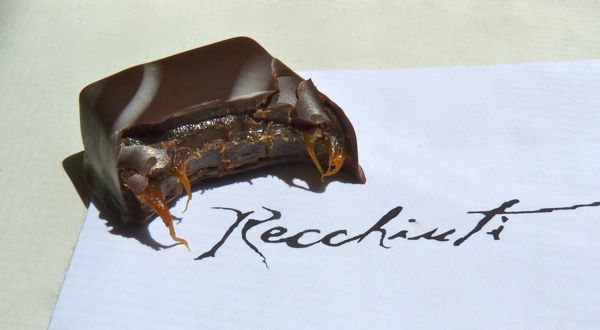 This smooth, two-bite, Fleur de Sel from Recchiuti was filled with flavorful burnt caramel with just the right amount of soft stretch-and-chew to it, and flecked with tiny pieces of French sea salt. Today was Day #5 of Chocolate and Sea Salt Theme Week, and Day #1 of Chocolate and Salt Caramel Theme Week. There may be a fair amount of overlap between these two theme weeks. In any case, adding caramel was a good excuse to prolong the experimentations with chocolate, salt and sugar.